Baring any terrible, terrible damage bugs, Release 8 will be the final 3.5 version of Json.NET. Json.NET supports including type information in JSON. In the past this was a global flag to include type names for every object. The last release of Json.NET added TypeNameHandling as a flag on JsonPropertyAttribute, allowing type names to be included only for specified values. Any payload of data can be assigned to Message.Body and the type name will be included when it is serialized. Json.NET will automatically deserialize back to that type. Another new TypeNameHandling feature is TypeNameHandling.Auto. When serializing an object and this flag is set Json.NET will check whether the value of a object matches the property it is declared against. If they aren’t the same, e.g. a property with a type of Mammal has a derived instance of Dog assigned, then Json.NET will automatically include the type name. TypeNameHandling.Auto is pretty neat in that it will ensure that type information isn’t lost for you automatically. Here is a complete list of what has changed since Json.NET 3.5 Release 7. 12 years (!!!) after Starcraft and Starcraft II is finally playable. I remember talking with friends just after the first game came out about what we thought the sequel, sure to be ready in a couple of years of course, would be like. So naive 1998 James, so naive. Beyond being a really fun game to play, Starcraft is also exciting to watch. It is the most successful “e-sport” videogame in the world, with hundreds of pro-gamers making a living off playing Starcraft. Korea in particular loves the game; Starcraft is practically the national sport. Entire TV channels there are dedicated to nothing but pro-gamers playing Starcraft, complete with live commentators. This videocast is by a famous personality in the English speaking Starcraft world, Day, and life growing up playing Starcraft. His brother is also heavily involved in the game and I found their journey growing up together really inspirational: from kids in a small town in Kansas playing a videogame on their old home computer, to competing in and winning international Starcraft tournaments around the world, powered by nothing but an incredible love of the game and the support of their mom. Did you know that the good old XmlSerializer had support for conditionally deciding what to serialize through ShouldSerialize methods? Me neither. Not to be outdone, Json.NET is now able to dynamically include and exclude properties the same way. Add a boolean method with the same name as a property and then prefixed the method name with ShouldSerialize. The result of the method determines whether the property is serialized. Now include with the Json.NET source code are the build scripts used to compile and package Json.NET. A couple of months ago I switched from a clunky old batch script I had been using to Powershell and psake. Compared to past solutions I’ve written using NAnt I’m very happy with the results. XML be gone! As always there are a crazy number of major (ISerializable support, LINQ to XML XmlConverter support) and minor new features (support for reading octal and hexadecimal numbers from JSON, numerous improvements to the serializer). Json.NET Release 7 has the biggest change list yet – in fact I had to edit the descriptions of the changes down to fit them all in CodePlex’s release notes size limit! 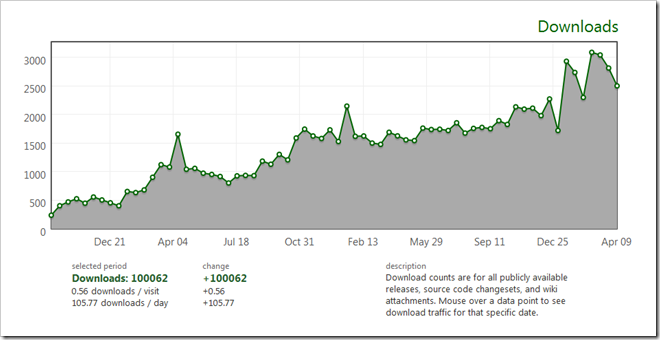 Here is a complete list of what has changed since Json.NET 3.5 Release 6. The guys at Penny Arcade have branched out from podcasts to a web TV show with predictably hilarious results. There are a lot of good episodes (PA’s crazy hire process!) 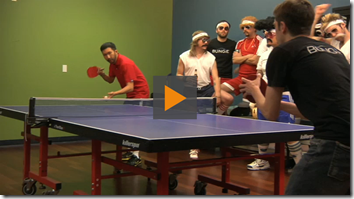 but I really love this duo covering Penny Arcade’s obsession with Ping Pong and a rematch game against Bungie, the makers of my beloved Halo. Smack talk, slow-mo ping pong action shots and an agonist sporting a sinister English accent – what’s not to like? NPR: Planet Money Podcast – We Bought A Toxic Asset! I wouldn’t call Planet Money a pure economics podcast – it definitely has a bit of an opinion about some economic social issues so viewer discretion is advised – but that doesn’t mean it isn’t interesting. This episode the people at Planet Money buy a toxic asset and explain in simple language what a toxic asset is and why and how you would buy one. It is a lot more entertaining than I ever would have thought possible. Oh and bonus points for playing both The Gambler and Danger Zone in a single podcast! Binary data and text file formats (JSON, XML) don’t tend get along. To be included in JSON or XML binary data has to be encode into a text friendly format, generally base64, which creates overhead both in the time spent encoding/decoding binary, and the extra size of the text encoded data in the message. 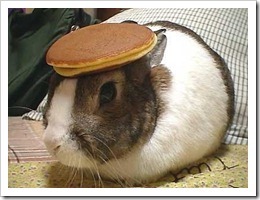 FileName: bunny_pancake.jpg Author: Hironori Akutagawa Caption: I have no idea what you are talking about so here’s a bunny with a pancake on its head. Json.NET and the DataContractSerializer are about equal to each other in the size of the resulting message – each is encoding the image byte array as base64 encoded text. 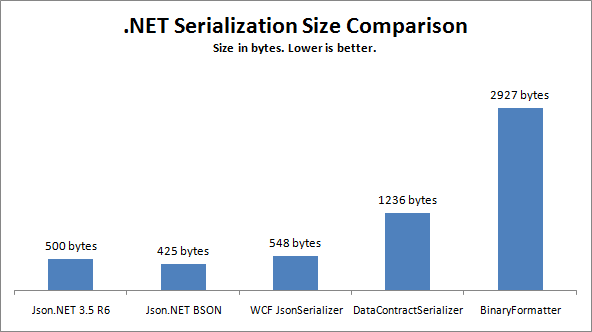 The small edge to Json.NET comes from the smaller size of the JSON metadata compared to the DataContractSerializer’s XML. Json.NET BSON and the BinaryFormatter are binary formats so they can include the image data directly in the message. They’re approximately 25% smaller than JSON/XML by saving the overhead of base64. Again the Json.NET BSON format is more efficient than the BinaryFormatter making it slightly smaller. Finally as you can see the WCF DataContractJsonSerializer is by far the least efficient. 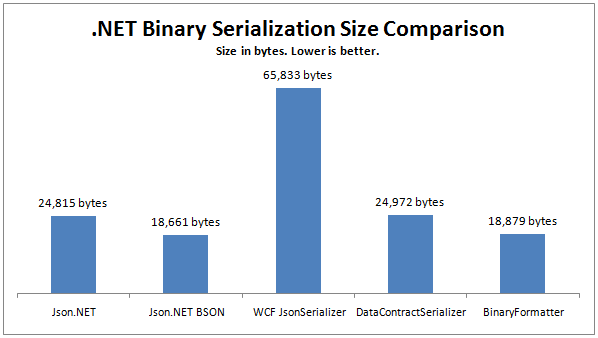 When I looked into why it performed so badly it turns out that the WCF JsonSerializer serializes binary data as a JSON array of integers, one integer representing each byte. It goes without saying that you should never use the WCF JsonSerializer with binary data. 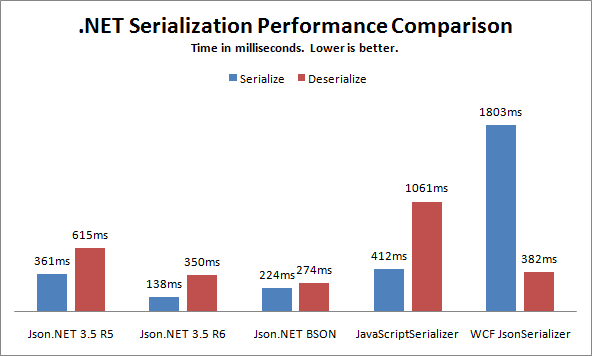 A lot of work around performance went into the latest release of Json.NET, with big improvements in both serializing and deserializing over the previous version. 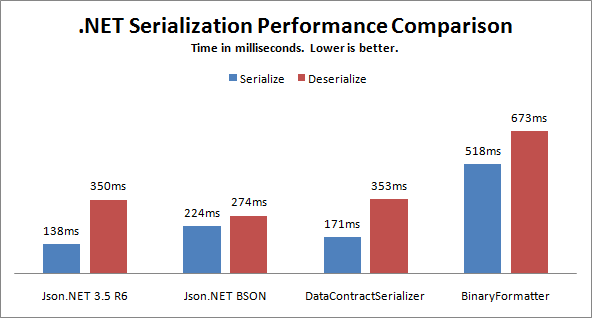 The latest performance improvements now puts Json.NET on the same level as the XML based DataContractSerializer which is pretty remarkable. 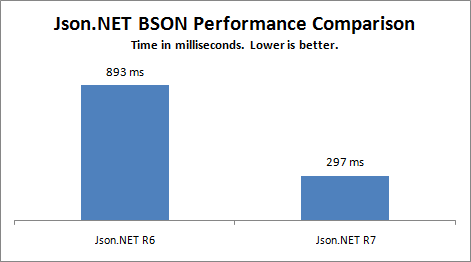 Also worth noting is Json.NET over binary (BSON) is considerably faster than the .NET BinaryFormatter. Finally one of the benefits of JSON is its smaller size when compared to equivalent XML. The output of Json.NET is less than half the size of the XML that DataContractSerializer produces (strings have been encoded to UTF8 bytes). In this test the BSON result is marginally smaller than the JSON result. BSON really shines when serializing byte data (i.e. images, movies, files, etc) where its output will come in at least 30% smaller over JSON because there is no base64 encoding of byte data. You can find the latest version of Json.NET, including source code with the performance tests, here.